How do you teach statistics with limited access to computers? Last century this wasn’t really an issue, at least not in high schools, as statistics has been a peripheral part of the mathematics curriculum and the mathematics of statistics has been taught as a subset of mathematics. But this is changing, and it looks as if the change is starting in New Zealand. The NZ school curriculum has leapt ahead of the rest of the world. Statistics is taught at all levels and at the higher levels of high school, statistics is taught as it is actually done in practice – using computers. All analysis is done by a computer package, particularly using iNZight, a purpose-built, free package. The emphasis is on understanding, concepts and critical thinking, rather than the mechanical and slow application of formulas. The rigour has moved from the calculations to the meaning. It is SO exciting! One big concern for many teachers is access to computers. In many schools there aren’t enough computer suites to schedule the students in for their statistics classes. So how do we deal with this? It might seem that the computers are needed every day, but in fact they aren’t. And neither is it necessary to have one computer per student. I’ve never had a problem when students have had to share computers. I find the people who do share a computer, learn better than those who are trying to work it out on their own. I actively encourage sharing computers in a lab. I recently had the opportunity to be on the learning end, with computer instruction. The teacher was showing what to do at the front, and we in the class were echoing her steps on our computers. This is not ideal, as it requires everyone to be at the same pace, but as we were adults it was fine. I hadn’t brought my laptop, so I was sharing with another student. I’m pretty sure I learned more, as I got to follow what was happening on both computers, rather than trying to work it out and keep up. I was also able to help my partner, as she would lose track of what was happening when her computer wasn’t doing what it was meant to. I have found this to be true at all levels, especially when learning a new package. Having two heads at the computer encourages discussion, which is an important element in learning. Students are also more likely to ask questions when they have already discussed a problem with another student. Pairing is so useful that some software companies get programmers to work in pairs, sharing a computer and work desk, because they have discovered that this has benefits. I am currently developing resources for a unit in time series analysis, based on the New Zealand curriculum, and using the free software, iNZight. At first glance, you might think that the entire unit would need to be taught in a computer lab. This is definitely not the case. And because of the layout of many computer labs, in fact you are better to stay out of them for most of the unit so that students can work in groups. I find that it is worthwhile to think about the attitudes, skills and knowledge that we wish our pupils to develop in a unit – in that order of importance! These examples are illustrative rather than exhaustive. Attitudes – By the end of the topic all students should feel that time series analysis is interesting and relevant (and maybe even fun!). Time series analysis is pretty straightforward at the beginner level, but can be quite exciting. Once you know the basics, and with a convenient package to speed up the mechanics, you can do some interesting detective work. I would want the students to share some of this excitement, and start to explore on their own. identify elements of a time series, relating them to the real life context. write a report on a time series analysis using correct terminology, clear enough for a non-expert reader to understand. use iNZight to analyse different time series. And that is about it really! So how do we do this, with or without full computer access. Even with unlimited computer access I would get students to work in pairs for much of the time. I would start away from the computers. First display graphs of time series to the class and get them to write down sentences about them in their pairs. Then share with the class. We should get sentences like, “It mainly goes up, and then it goes down” and “there is a pattern that repeats”. From that the teacher can introduce the ideas of trend, seasonality and noise, modelling the correct use of specialist language. Then I would talk about the context – or maybe the context should have come first… The time series chosen should be one with an easy to identify context, such as retail sales of recreational goods, or patterns of tourist arrivals. These series are available in New Zealand at Infoshare or in iNZight format via Statslc. Other countries will have similar series available. Again get the students to write down sentences, this time relating them to the context. Homework could be to find a graph of a time series on-line or in a magazine. Or to make a list of things that might show seasonality. Next I would get the students onto the computers in pairs. They should have a worksheet like the one here, so that they can work step-by-step through the package at their own pace in pairs. At some time during the class they could swap roles, if one has been instructing and the other operating. The data set here RetailNZTS4 has four series in it, which show different behaviours. Students should see if they can get all the graphs they need for further analysis. The next class is away from the computers again. Here they are writing sentences about the graphs. They should do this alone, and in pairs, and compare in groups. It would be good to have a computer or two available for students to take turns to get any graphs they might find they need. When people are in front of a computer it tends to dominate their thinking and they can produce far too much output with very little thought. Moving away from the computer encourages a more reflective approach. Then start on another data set. I would use the one about accommodation, AccRegNZTS13 comparing the seasonal patterns of occupancy in different regions of New Zealand. If there are enough computers, the students can spend one day creating the graphs and exploring, then the next day writing it up. Maybe different groups could take different regions, and find out why the pattern is the way it is for that region, then report back to the class. The learning is in the writing and the talking. The point I’m trying to make is that you actually need to move away from the computers quite often. If you are REALLY stuck for computers you could even print off (and laminate?) 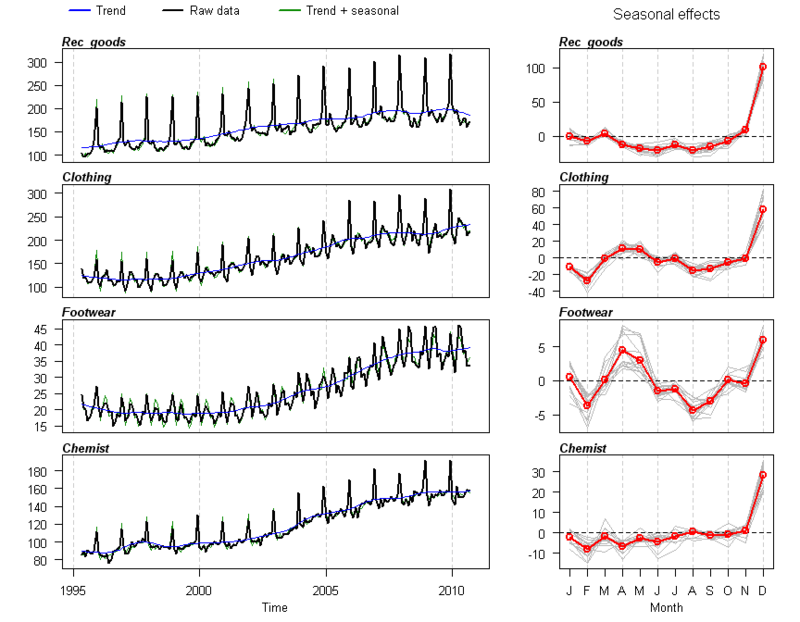 the outputs from the different time series, so that the students can study and discuss them. Number or name them for easy reference, and have question sheets to go with them.The computer is only the tool, and with a bit of creativity, we can still teach the important attitudes, skills and knowledge with limited computer access. I am aware as I am writing this that it is some time since I taught a class of high school students. I would be thrilled to hear comments from the “chalk-face” as to how realistic you think this is! And of course other suggestions will be welcome for teaching a computer-rich subject in a computer-poor environment. Having said that, one of my experiences as a trainee teacher was having to teach my first lesson to a class at Rotorua Lakes High School during a powercut – which meant no computers and no OHP. We did desk-checking (how you can use pen and paper to look for bugs in code) and it went surprisingly well. I appreciated your emphasis on writing down things that in effect were saying “what does this mean?”. This can and should be done at all stages of a problem, but especially at the end. If one cannot discuss possible meanings from the analysis one has done, little has been achieved. In the past I have said, “Often the answer from a good statistical analysis is more questions”. It can clarify what needs to be asked about a process. Keep up the good work. Thank you, Jean. I really appreciate your endorsement of my efforts. Great article! I think that statistics is very helpfull to understand most of the economic things. Most of the students don’t understand basic terms.